It’s important to have the seasoned professionals at Blue Frog Appliance Repair perform your trash compactor or garbage disposal repair because malfunctioning waste disposals can be dangerous, especially when dealing with the sharp blades inside the sink disposal.The kitchen sink is a necessity for cooking preparation in your Castle Rock, Parker, or south Denver metro household, so it is imperative to ensure your sink disposal is running efficiently and safely. Our appliance repair technicians make repairs to major laundry and kitchen appliance brands including, but not limited to: LG, Samsung, GE, Whirlpool, Kenmore, Maytag, Amana, Kitchen Aid, and Frigidaire. 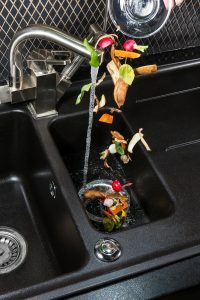 We have the specialized tools and experience to help your family get your garbage disposal and trash compactors back in action so you don’t need to worry about having to constantly deal with garbage disposal smells or other inconveniences. My garbage disposal is clogged. My garbage disposal is leaking. My garbage disposal is jammed. My garbage disposal is making abnormal noises. Blue Frog Appliance Repair provides affordable garbage disposal repair with same-day service when you need waste disposal troubleshooting or replacement parts quickly. We repair both continuous feed sink disposals or batch feed waste disposals. We’re confident our repair technicians can find the most effective resolution to any of your waste disposal problems! My trash compactor is not compacting garbage. My trash compactor won’t turn on. The drawer will not open on my trash compactor. My trash compactor smells or is noisy. Contact Blue Frog Appliance Repair today for these or any of your other waste disposal repair issues. Broken waste disposal appliances stink, both literally and figuratively, so don’t suffer through it! Call us for your trash compactor and garbage disposal repair now! Contact Us Today at 720.336.1349 or fill out the form below! "Serving Parker and Castle Rock and surrounding areas for all your appliance repair needs"